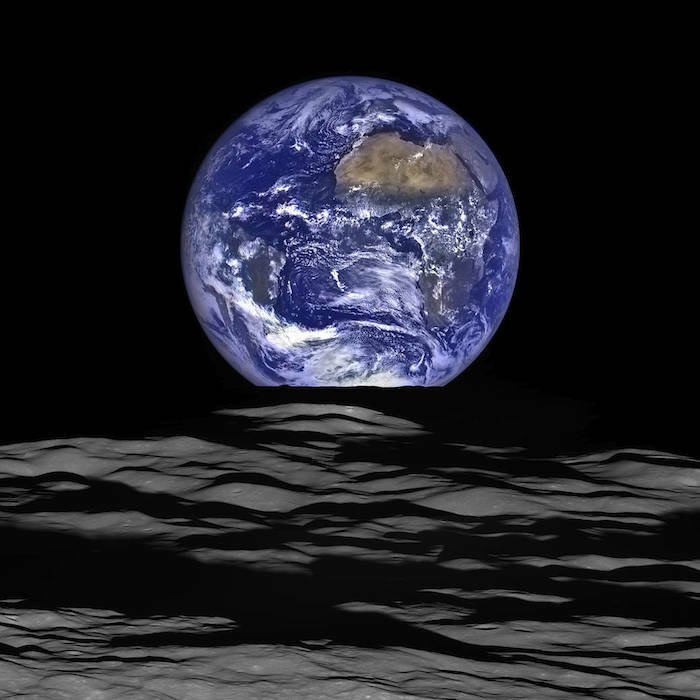 NASA's Lunar Reconnaissance Orbiter (LRO) recently captured a unique view of Earth from the spacecraft's vantage point in orbit around the moon. "The image is simply stunning," said Noah Petro, Deputy Project Scientist for LRO at NASA's Goddard Space Flight Center in Greenbelt, Maryland. "The image of the Earth evokes the famous 'Blue Marble' image taken by Astronaut Harrison Schmitt during Apollo 17, 43 years ago, which also showed Africa prominently in the picture." "From the Earth, the daily moonrise and moonset are always inspiring moments," said Mark Robinson of Arizona State University in Tempe, principal investigator for LROC. "However, lunar astronauts will see something very different: viewed from the lunar surface, the Earth never rises or sets. Since the moon is tidally locked, Earth is always in the same spot above the horizon, varying only a small amount with the slight wobble of the moon. The Earth may not move across the 'sky', but the view is not static. Future astronauts will see the continents rotate in and out of view and the ever-changing pattern of clouds will always catch one's eye, at least on the nearside. The Earth is never visible from the farside; imagine a sky with no Earth or moon - what will farside explorers think with no Earth overhead?" NASA's first Earthrise image was taken with the Lunar Orbiter 1 spacecraft in 1966. Perhaps NASA's most iconic Earthrise photo was taken by the crew of the Apollo 8 mission as the spacecraft entered lunar orbit on Christmas Eve Dec. 24, 1968. That evening, the astronauts -- Commander Frank Borman, Command Module Pilot Jim Lovell, and Lunar Module Pilot William Anders -- held a live broadcast from lunar orbit, in which they showed pictures of the Earth and moon as seen from their spacecraft. Said Lovell, "The vast loneliness is awe-inspiring and it makes you realize just what you have back there on Earth."